A scheme offering lower cost ferry fares will be rolled out to all remaining ferry routes in the Clyde and Hebrides network in October 2015. Road equivalent tariff (RET) was first introduced on Western Isles, Coll and Tiree services in 2008. It was expanded to Islay, Colonsay and Gigha in 2012 and will be introduced for Arran this autumn. 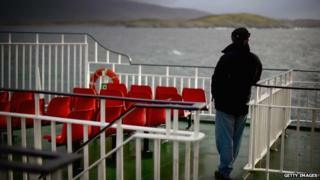 Transport Minister Keith Brown said the roll out would involve a further 14 ferry routes. They include services to Barra, Mull, Eigg, Skye, Raasay, Cumbrae, Muck and Rum. RET, which links ferry fares to the cost of travelling an equivalent distance on land, covers fares for passengers, cars, small commercial vehicles and coaches. The scheme has drawn criticism from some areas. Operators of heavy goods lorries were angered by the withdrawal of their road equivalent tariff discounts in 2012. The government later provided funding to lessen the impact of the move. Northern Isles' politicians have also been calling for RET to be applied to routes serving Orkney and Shetland. The Scottish government said next year's extension of the scheme was a key commitment made in the Ferries Plan, which was published in December 2012. Mr Brown said: "We promised to extend RET to the remaining west coast and Clyde islands within the term of this parliament, so I'm delighted to announce it will go ahead in October 2015. "We have already seen the positive impact of RET on other ferry routes around Scotland. This further roll out is expected to bring similar economic and tourism benefits." He added: "While the fares for the 2015/16 winter timetable have still to be set, announcing this date now will allow local businesses to plan ahead for the introduction of the RET pilot. "We would expect a reduction in fares to lead to an increase in demand on these services, particularly during the summer timetable." Orkney Liberal Democrat MSP, Liam McArthur, said the exclusion of the Northern Isles from RET was "politically motivated". He said: "Reducing the cost of getting to and from our islands can deliver enormous economic and social benefits to these communities. "That is why it should be a key commitment for any government. However it must be done on the basis of fairness to all. "Spending millions of pounds of public money targeting a scheme at some islands but not others will strike most people as unfair and unacceptable." Comhairle nan Eilean Siar has welcomed the announcement that more Western Isles routes will offer lower cost fares. John Mackay, chairman of the local authority's transportation and infrastructure committee, said: "The comhairle has long made the case that this would be of benefit to our island communities. "However, the comhairle would wish to see this long overdue measure introduced as soon as possible. "If it is of benefit and provides value for money why wait until October 2015?"